You’re walking down a sweltering New York City street in July, sun radiating off the sidewalk, the air thick as pea soup, when, suddenly, a blast of cool air washes over you through the open door of a bodega. Many New Yorkers find such air-conditioned breezes refreshing. But Mayor Bill de Blasio has never cared for them. 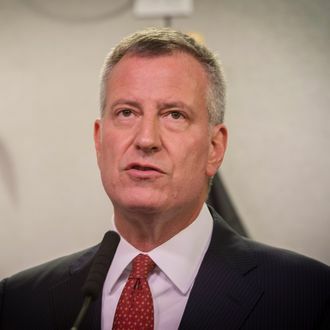 “It’s always been a pet peeve of mine,” said de Blasio at a City Hall ceremony Wednesday, just before signing a law that will require all shops and restaurants in New York City to keep their front doors and windows closed while their air conditioners are running. Business owners who violate the rule will be fined — $250 for a first offense, up to $1,000 for an especially egregious violation. The bill builds on prior legislation that barred large retailers from engaging in “the comingling of indoor and outdoor air,” according to the New York Times. If you’re worried this means an end to sidewalk dining, fear not. Councilman Costa Constantinides told the Times that sidewalk cafés and restaurants with outdoor space for alfresco dining are exempt from the new rule.